In America, professional athletes are arguably overpaid, mostly young and subjected to a lot of rules, rituals, procedures, advertisements, propaganda as well as mainstream media news. In fact they are pressured to go along with whatever the mainstream media says. This is all part of today's mass brain washing, the globalist, collectivist mentality or the group-think phenomenon. It's not okay to speak out on real issues that the government wants to keep a secret (e.g. 9/11 truth, government false flags and exposing fake events like Sandy Hook) but it is okay to speak out on issues that the mainstream media endorses like the current planned American Color Revolution based on identity politics. This is an agenda which is all part of the Communist/Globalist planned destruction of America designed to usher in their new global order which will ignore the relevance of the nation state. Young professional athletes, like Hollywood celebrities find themselves on the receiving end of a lot of deep state propaganda and it's only a matter of time before some of these young athletes are influenced and compelled to action by this ongoing propaganda. This is what we are now seeing. Maxwell explains his protest in very vague terms (IMO) not clearly defining his purpose aside from the obvious solidarity with former NFL quarterback Colin Kaepernick who remains unsigned by any NFL team. The Kaepernick issue is yet another perplexing issue since teams are allowed to freely decide what players they want to pursue. The social justice warriors apparently don't understand the free market. Maxwell however, showed the world a couple of days ago that this is as much about his dislike and resistance for president Trump as much as anything else. When you remove the words and the rhetoric what none of these players involved in these national anthem protests realize is that all of this is part of the planned Communist globalist agenda for undermining and dividing America with identify politics and what many Communist leaders call 'National Liberation'. For decades Communist leaders have focused their strategy on inspiring individuals to stand up against the state, to recognize how they are being oppressed by the state and learn to fight back. Without this sense of victimhood of course the entire Communist agenda and subsequently today's globalization movement would fall apart. You would think intelligent, well read and critical thinking Americans would be too smart to fall for this agenda right? Not at all. Young athletes as well as Hollywood celebrities and a lot of Americans indoctrinated in America's colleges and universities are all caught up in the planned national liberation, identity politics based propaganda which now threatens America itself. And this is the much bigger story here. And the reason this anti-America, anti-Trump revolution continues to gain steam is because people like Hillary Clinton, Barack Obama and George Soros are funding this revolution and the mainstream media and social media are pushing this also. 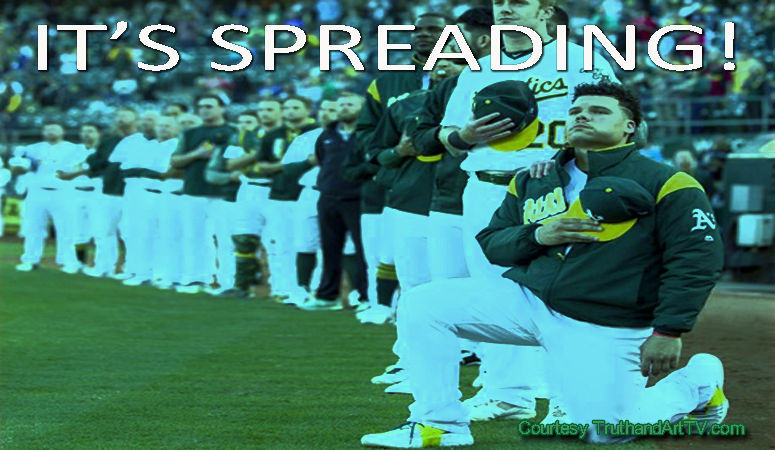 As we saw with the NFL where Commissioner Roger Goodell recently defended the politicization of the NFL and lashed back at president Trump, both the Oakland A's and Major League Baseball are using the "free speech" argument to allow their players to make political statements. The much bigger story here is that this is just the beginning of the end of America if the globalist have their way. Americans are now having to choose whose side they are on as I have been saying all year. The deep state which is undermining president Trump will continue its attack on America and now they are spreading their "revolution" everywhere you turn. Whether it's late night shows, concerts, TV shows, mainstream media news, Hollywood movies, celebrities, colleges, universities, multi-national corporations and now professional sports. The revolution against America and for the birth of the new world order is all around us. Try to recognize it and think carefully about how you will approach this now unavoidable fight for America.